A Custom Lamp Shade will let your personality shine throughout the room. Our easy to use online design tool makes designing custom shades easy and fun. Upload your favorite photos, graphics, or words to customize your own lamp shade today to make gorgeous custom lights for home, or gift. Make collage shade too, our system generates it automatically for you. Turn up the lights and watch your much loved photos come to life. Our drum lampshades are made from a translucent, slightly textured matte fabric that looks stunning when lit up from within. Our 4 sizing options include 3 round drums and 1 small oval, so you can really tailor it to your home décor needs. 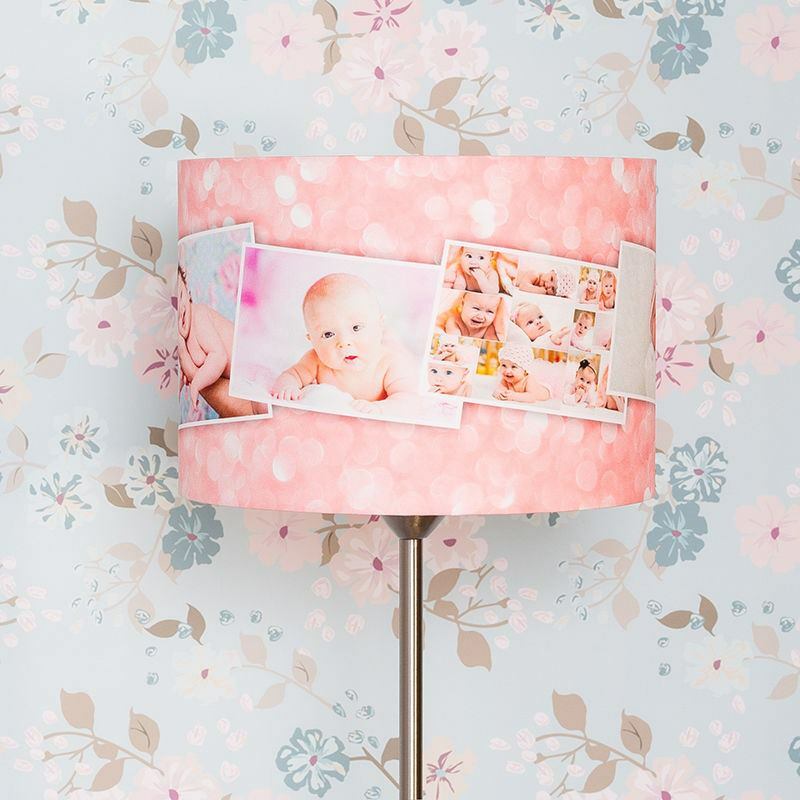 Whether you've got unique artwork or a family photo you want to show off, your home will be that little bit brighter with personalized lamp shades. I was able to use my personal artwork (sent as a jpg). This company reproduced it into fabric and made an adorable lampshade! Perfect in our grandchildren guest room. The website was easy to use and the shade came much quicker than I had anticipated. The only issue is the shade hardware which is different than what we normally see here. I am taking it to a lamp store and aim sure they can secure it. It turned out amazing. It will be a wonderful treasured gift. Very handsome, light--beyond what I expected! Prompt delivery of our lampshade, filled with photos. Most of the photos were taken with lousy cellphone cameras, but the quality of the photos on the lampshade was quite good. We get good reading light through the shade (use a low-watt bulb to avoid burning the plastic attachment that affixes the lampshade on top of the bulb). I'd order one again! Your shade will come with a removable adapter to alter the size of the fitting ring, as displayed in the image above. Your photos or design are printed onto our semi-translucent fabric and then backed with a fire rated lining. Edge-to-edge printing all over with a white painted metal frame at the top or bottom depending on whether it's a ceiling or table lamp shade. For Your Safety: Inner layer is a BS standard fire rated material - BS EN 60598 - 1:2008 650 Glow wire test (clause 13.3.2) only. For the smaller sizes - 20cm round and oval - the maximum wattage is 40w bulb. For all other sizes, use 60w-100w bulbs but we recommend cool energy saving bulbs for all our lampshades. Your photo or design is wrapped around the drum with full-color edge-to-edge printing. The fabric we use is stiff, matte, translucent with a slightly textured finish, giving your unique lampshades an authentic look. Turn on the light and enjoy seeing the soft glow through the shade. Even with the light off, your photos are still vivid. Your shade will come with a removable adapter to alter the size of the fitting ring, as displayed in the image above. All lampshades are made by hand. Your photos or design are printed onto our semi-translucent fabric and then backed with a fire rated lining. Edge-to-edge printing all over with a white painted metal frame at the top or bottom depending on whether it's a ceiling or table lamp shade. Capture your travelling memories and create a photo collage following the guidance above. Place in your office or study for a touch of culture and an interesting conversation starter. Customize our round lampshades as a gift for your son or grandson. Printed with their favorite comic book hero or sports club, their bedroom will be totally unique to them and their interests. You could even let them design their own and watch their imagination go wild. To congratulate the newlywed couple, gift them with a personalized lamp shade featuring special photos from the big day. Not your average wedding present, it'll stand out from the rest and also illuminate their home with happy memories.